The Forest Estate is situated about 34 miles southeast of Ayr off the A713. The entrance to the estate is about 7 miles south of Casphairn, 2 miles north of Dalry, with signs at the entrance stating Forest Estate. This is a good scenic, single track, tar road with many passing places. The range here is known as the Corserine range or Rhinns of Kells, containing from the north, the 1,732 ft Black Craig, 2,043 ft Coran of Portmark, 2,011 ft Bow, 2,162 ft Gairnsgarroch, 2,280 ft Meaul, 2,648 ft Carlin's Cairn, 2,671 ft Corserine, 2,034 ft Meikle Craigtarson, 2,349 ft Millfire, 2,421 ft Milldown, and 2,457 ft Meikle Millyea. This photo tour shows the route up the southeast ridge of Corserine, then south across to Millfire, south to Milldown, then down the east side of Meikle Millyea. Large Hill Route Map . The image below is of The Green House situated about 2 miles along the estate road. This is a Natural Power Organization. After about 3 miles from the start of the estate road, you reach the hiking car park with seating areas, as seen below. There is a map here that shows the roads throughout the forest to the hills. Many of the roads are named after people. There is a sign here that states: if any cars are left in the car park after 8 o'clock, the estate management will report the owners as being lost in the hills or forest, and may need rescuing. Even though the trails are marked, it is best to carry an OS map as there are many other forest roads here that you can take a wrong turn onto and get lost. The road straight ahead is the Professor Hans Heiberg Road. This road is normally used out to, or on the road back from the most southern hill on this range, Meikle Millyea. The main tourist trail to Corserine leads off to the right in this image on a well marked path. This car park is about 330 feet above sea level. 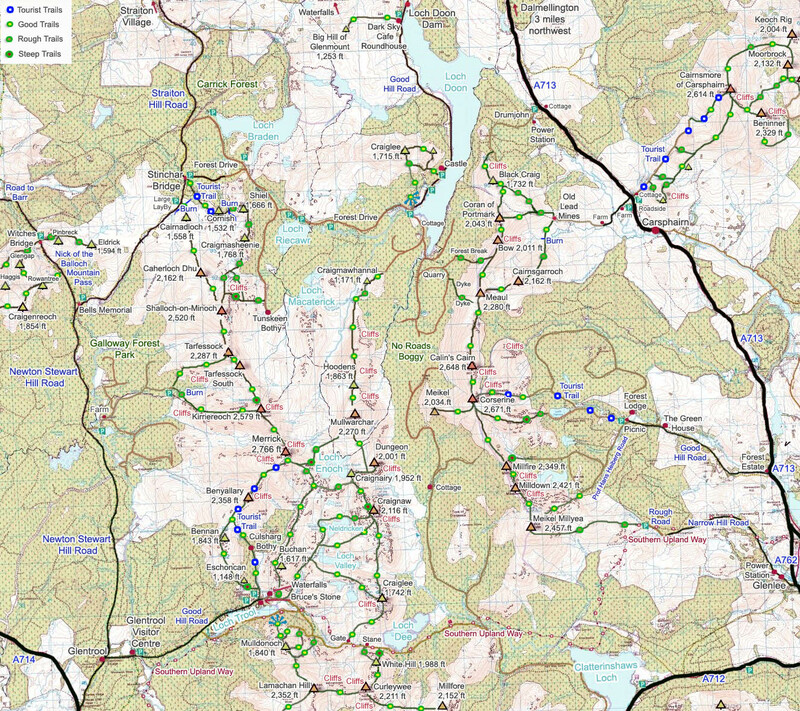 The map below shows two east side trails up Corserine, the trail in blue is the tourist trail up past Loch Harrow and up the northeast ridge. This photo tour is going up the steeper southeast ridge of Corserine past the south side of Loch Harow. Time wise, these two east side routes to the top of Corserine are about the same. On the road round to Corserine, over to your right through the trees, you will see a figurehead, as seen below, at the entrance to the Forest Lodge. This figurehead is from the Fred Olsen passenger liner named the Black Watch that was sunk during the Second World War. The ship was operated on the Newcastle - Oslo route. The estate must have connections to the Fred Olsen cruise line, explaining why many of the forest roads have Scandinavian names. The forest road to Corserine heads up into the forest past a white house, as seen below. After about half of a mile to a mile past the white house, your reach a road on the left with a sign stating Birger Natvig Road. The image below is from walking down Birger Natvig Road, and looking across Loch Harrow to the Corserine southeast ridge. The forest road runs all the way round to a short forest break, next to a small quarry. I hiked up through the trees on the left side of the forest break, then took the route as seen below, there are a number of routes that can be taken. I find the steepest routes give the best pictures, and are normally the driest. There was about 50 yards of tussocks between the forest and the little hillock, that was not the best hiking, but from then on it was good going, although steep in places. If you want to take an easier route up, follow the blue signs up past this road to the northeast ridge Tourist Trail. The two ridges are similar, but the northeast ridge has a path leading up where there are no really steep parts, just steadily steep most of the way. Tour of the Tourist Trail. The image below is looking down from close to the top of the first ridge, looking back down to the forest break and Loch Harrow. The image below is from the top of the first ridge looking at the route up to the second ridge. I went straight up here but there are a number of less direct routes. The view below is from close to the top of the second ridge, looking down to loch Harrow and the forest road leading round the south side of the loch. The view below is from a cairn on the southeast ridge looking to Corserine summit. The image below is from about half way between the southeast ridge cairn and Corserine summit, looking back down from an aircraft crash site. This crash site is said to be the one of a Second World War de Havilland Mosquito. The image below is from another aircraft crash site on the north side of Corserine, by the route over to Carlin's Cairn. This crash site is said to be of a Second World War Avro Anson. It takes about 1 hour to hike over to the 2,648 ft Carlin's Cairn and back. There are 4 other hills north of Carlin's Cairn above 2,000 ft, those are normally hiked from the Old Lead Mines at Casphairn. The image below is from Corserine Trig Point looking south to Millfire, Milldown and Meikle Millyea. The route across these hills is fairly straight forward with all the danger on the east side, if visibility is poor. The view below is when hiking across to Millfire. Note the high drops on the east side of Millfire, about 1,200 feet. The view below is the north side of Millfire, about 300 ft from the lowest part of the crossing to the summit. The image below is from the cairn on Millfire looking south to Milldown and Meikle Millyea. It is about a 200 feet hike up to Milldown from the lowest part of the crossing. The image below is of the rocky east side of Milldown. This looks a challenging hike up, about 1,300 feet of picking your way up between the rocks. The image below is looking back from Milldown to Corserine and the steep route up the rocky east side of Millfire, about 1,200 feet. The image below is from the cairn on Milldown looking south to Meikle Millyea. On the left of Meikle Millyea summit is a cairn and Trig Point, and on the right is a cairn, said to be at the highest point. It is about a 350 feet hike up to the summit from the lowest point on the crossing. The image below is from Trig Point on Meikle Millyea looking back at Milldown, Millfire and Corserine. About 500 yards southwest of this point is another cairn, said to be on the highest point on Meikle Millyea. The southwest cairn gives good views over the hills on the south side of Loch Trool, such as the 2,211 ft Curleywee and 2,352 ft Lamachan, that have an interesting ridge between them. The image below is going down the east side of Meikle Millyea following a stone dyke/fence. There is a path all the way down next to the dyke. This is a long way down, or up if you do the route from this side first. You can just see a white farm house in the image below that you pass on the way back to the car park, and Forest Lodge in the trees just beyond the white farm house. The image below is from the lower ridge on the route down the east side of Meikle Millyea. The path follows the dyke all the way down, or close to the bottom, another path leads over to this steep way down. The stile leads to a short forest break that has a few trees laying across it, so takes a bit of a detour round the trees to reach the forest road. The road down to the right, past the watch tower, is the Professor Hans Heiberg Road. This road leads back to the Forest Lodge car park, about 2 and a half miles. The Professor Hans Heiberg Road leads straight to the car park, best not to turn onto any other roads on the way. This was a fairly tough hike of about 3,100 feet, when adding up the climb onto Corserine, taking into acount the car park is about 330 feet above sea level, and adding the climbs between the other three hills. This route probably averages about 7 hours. I tend to take longer as I normally have to wait around a lot to get sunny pics, and like exploring many of the sub peaks. Photo Tour of Corserine range north hills.